British Labour Party leader Jeremy Corbyn met with Kurdish solidarity activists on March 30, according to the campaign website freedomforocalan.org. The Kurdish people are an oppressed nationality without a state, whose homeland is currently divided between five countries in the Middle East. Despite this, the left-wing Kurdish movement in Syria’s north is not fighting for a separate nation state. Rather, it is seeking to unite all ethnic groups and religions to fight for an autonomous, participatory democracy as part of a profound social movement that puts women’s liberation at its heart. A large minority in Turkey, at about 20% of the population, the Kurdish people have long faced systemic discrimination by the Turkish state. This has included massacres and violent repression of their culture, with even the Kurdish language banned until recently. Such oppression led to the Kurdistan Workers’ Party (PKK) launching an armed struggle for national liberation in 1984. In recent years, the PKK — whose leader Abdullah Öcalan remains in solitary confinement in a Turkish jail — has declared its commitment to a peaceful solution to the conflict. British Labour Party leader Jeremy Corbyn told a meeting in London on September 15 that the Kurdish people’s right to self-determination needed to be recognised, Firat News Agency said the next day. The meeting was organised by the British Kurdish People’s Assembly. Hunger strikers begin their fast for Öcalan in Diyarbakır on September 5. A hunger strike was launched in Turkey’s Kurdish capital Diyarbakır on September 5 by politicians and activists demanding a meeting with jailed Kurdistan Workers’ Party (PKK) leader Abdullah Öcalan. Since late 2005 the Kurdistan Workers Party (PKK) has been included on Australia's list of terrorist organisations. It is illegal for Australian citizens to belong to the PKK, actively support it, raise funds for it or otherwise engage with it. Just this month Australian-Kurdish journalist Renas Lelikan was charged in Sydney with being a member of the PKK. 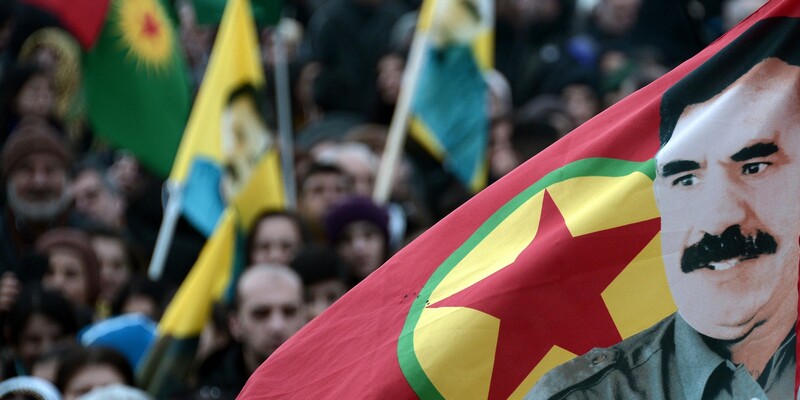 Flag of PKK with image of Abdullah Ocalan. Millions of Kurds view Abdullah Öcalan as their political representative. His freedom is directly linked to a democratic and peaceful solution to the war in Turkey. 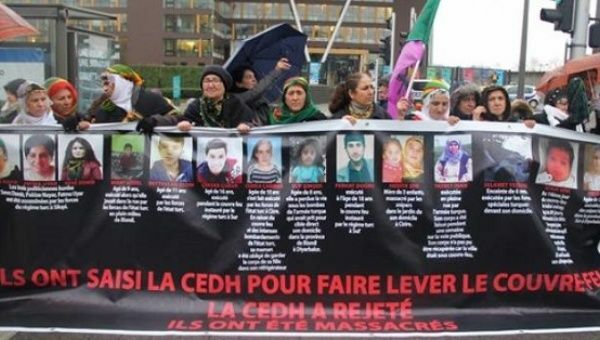 A coalition of pro-Kurdish European groups held a five day sit-in in front of European institutions in Strasbourg in eastern France, starting on February 23, to protest Europe's silence on the Turkish government's ongoing massacre of Kurds. The action targeted the European Court of Human Rights.